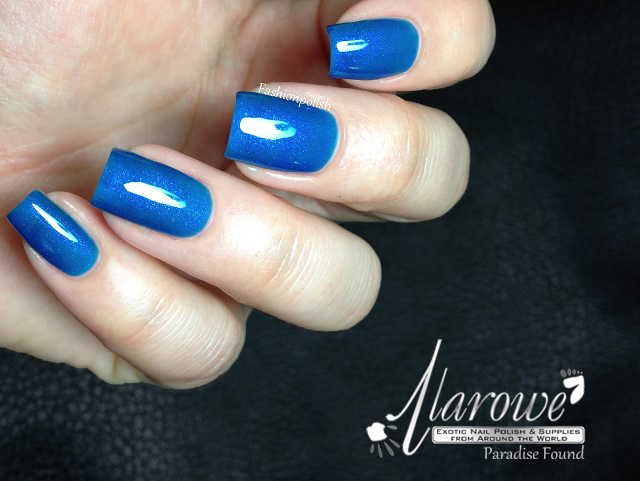 Fashion Polish: Two weeks of Color by llarowe : Paradise Found! Two weeks of Color by llarowe : Paradise Found! Are you ready to discover one more Colors by llarowe shade? Paradise Found is an ocean blue jelly infused with a slight sapphire and lilac shimmer. Unfortunately the lilac shimmer doesn't really translate on camera and although it's not "in your face" in real life either, it does add a subtle but nice flash. Formula was very easy to work with, applied evenly and required three coats for decent (not complete) coverage. If you look closely at my swatches you can see some VNL (Visible Nail Line) but Paradise Found is meant as a true jelly, glass-like, translucent shade and I love it this way. If opacity is a major concern for you, it might not be for you though. This is three thin coats plus topcoat. Well that (almost) it for today girls. I couldn't leave you without a sneak peek of what's coming up in the next two weeks... Especially since they're launching tomorrow, I had to help narrowing down the wishlists, right? Colors by llarowe Paradise Found (Beauty of Nature Collection) is launching on llarowe.com on June 6, 2013. I strongly encourage you to subscribe to the llarowe's newsletter to be notified on restocks. Oh my. This color is stunning! So pretty! The jelly-ness combined with the shimmer just makes it look so deep and beautiful. Wowwww I love this blue one. Hello, You do not show the bottle, is there a reason for that? Wow this is so beautiful. The jelly finish plus the shimmer makes it glow!